Note – This article was published on the Facebook page of Dr. Berhanemeskel Segni which was posted on October 3 2016, a day after more than 600 Oromo festivalgoers were murdered in cold blood at Hora Harsadi. Please note that the article is slightly formatted and supporting pictures have been included. There is no ambiguity that the Massacre at the 2016 Irreecha (Thanksgiving) Celebration in Bushoftu city where over 500 Oromo nationals are reportedly killed by the Ethiopian government forces was premeditated and preplanned! In a campaign of disinformation, whitewashing, and controlling the narratives in order to absolve the regime?s agents from responsibility, the regime and some foreign journalists sponsored by the regime are reporting as if the mass killing of the Oromo people at Bushoftu City, about 40km south of Addis Ababa was caused by the stampede. That is a pure and abhorrent lie. The regime?s attempt and their foreign collaborators plain and obvious fabrications by reporting the mass killings as if it caused by mere stampede is meant to hide the premeditated and preplanned criminal enterprise of mass killing of the Oromo people at an Annual Thanksgiving and family festivity the government knows an estimated two to five million Oromos are known to gather from all corners of Oromia will not fool anyone except themselves! 1.? Video and eyewitness accounts indicate that the government planned and deployed military helicopter gunships (not police helicopter) to fly over the sea of crowds of people before any sign of protest at the event. How could that happen? Does the regime deploy military helicopter gunship at Meskel Square at the Meskel Celebration or at Jal Meda during the Epiphany in Addis Ababa? Did they deploy Military Helicopter gunship in Mekele, Tigray, during mass rallies or festivities? No. This only happens in Oromia, where the people are categorically seen as an enemy population that should be excluded from all political and economic fortunes of that country including by deploying alien and oppressive security forces with few Oromo surrogates to serve as face-saving. 2. The government deployed armored vehicles with heavy armed machine guns mounted with military officers? dressed in a mask similar to what we see in Somalia?s Al Shabab or ISIS style(with their face fully covered) and ready to shoot. Who deployed these military officers and gave them the order to shoot at civilians gathered for holiday mass celebration? This does not happen by accident. It is not an order given by low-ranking officers either. What else could it be unless it is well planned, premeditated and organized deployment of armed forces of the government with an order to cause mass killings? 3. The Oromia Television (TVO) used to live transmit Irreecha celebrations every year, deploying journalists to cover each and every activity. TVO, under the total control of a known regime appointee, was a no-show at this year’s Irreecha celebration. 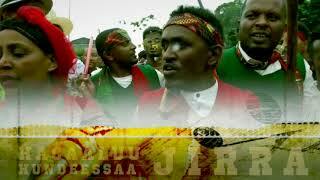 There was no live coverage of the Irreecha Annual Celebration, the largest and the biggest, and the only Oromo national holiday without national recognition. How could TVO just abandon its long-held traditions and practices of providing live coverage of Annual Irreecha Celebration without a preplanned and premeditated plan to hide something that was cooked in advance? Here, it is important to note that the regime that did not recognize Irreecha as the national holiday in Ethiopia or even failed to Livestream it on the Television station under its control, today claimed as if it is endeavoring to register Irreecha at UNESCO. It is also important to note here that most of the individuals who took the initiative to register Irreecha at UNESCO are in detention for this very same reason. ? ? ? ? ? ? ? ? ? ? ? ? ? ? ? ? ? ? ? ? ? ? DOWN DOWN Woyane!!! 4. Reports from the people who attended the event also indicate that against the tradition and culture of the Oromo people, the regime appointed on the spot at the event a well-known regime cadre as an Abba Gadaa by replacing the legitimate Abba Gadaa that caused the uproar and provoked the people to protest. Do such acts happen without any plan and premeditation when it is clearly apparent for anyone who knows the Oromo culture such things will immediately provoke people to protest? 5. Given the crisis going on in Ethiopia, particularly in Oromia over the last eleven months due to?#OromoProtests?and the resulting killings, arrests, and tortures in the regime?s gulags, the government knows or should have known that there will be protests and should have planned not to cause mass panic that certainly will lead to mass stampedes if any shooting happens let alone shootings from Helicopter Gunship and Armored vehicles with mounted machine guns directly firing on people at place where over four million people are gathered. Unless one operates with clear criminal intent and premeditated plan to cause mass massacre through stampedes, on whose mind will these things be lost let alone well-organized government institutions like the military, security and police forces who are trained in crowd control tactics in mass gatherings like the Irreecha celebrations? The bottom line: the totality of the evidence and factors taken together shows the?#BushoftuMassacre?was preplanned and premeditated with clear criminal intent to cause a mass massacre. They executed it with meticulous precision. But know this! No one can escape responsibility for it when the day to account comes!